First off we want to thank all the fans of OoME, we appreciate everything you have done and all the support you have given us as we have been making the comic. We have learned a lot from you all and have grown quite a bit in both the artistic and storytelling aspects of webcomics. Sadly, however, we have decided to put OoME on hiatus. We originally wanted to get this story out and see it to completion, but the truth is that it will take another 20 years to accomplish this at the rate we are going. While toning back the art style and simplifying some designs may assist in getting more pages out, it wouldn’t do justice to the comic. Top that with Alli returning to work soon and you can imagine how much OoME would suffer when it came to details (especially at the balls). 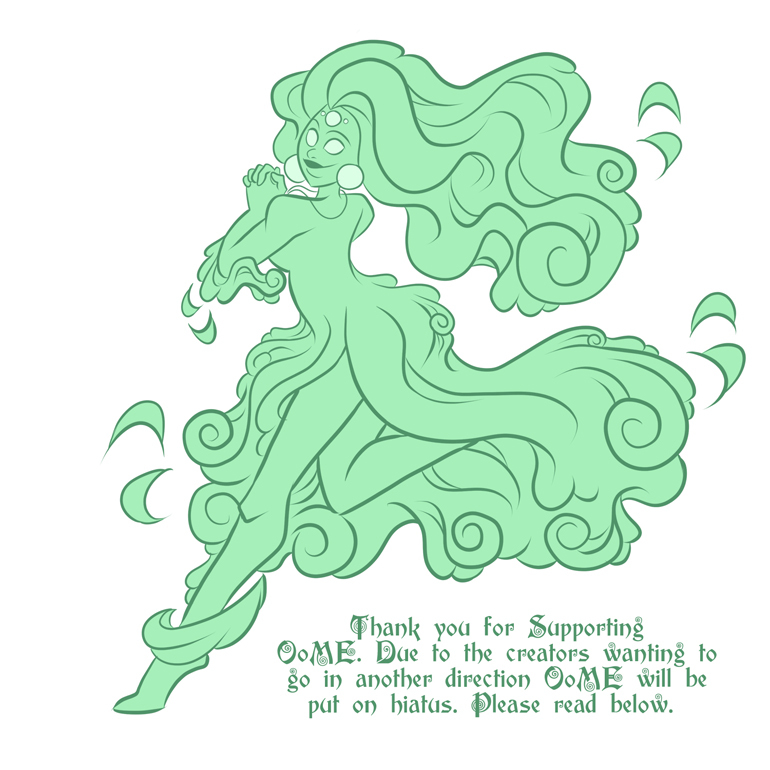 With the original character designs Alli had made of the OoME cast being so detailed, it was difficult for Alli to produce more than a page a week due to all of the work that went into each individual character. We looked at where we were headed and the fact that Alli was already feeling worn down by the process and we came to a decision that we had started with our sights aimed too high. With that being said, we are going to move forward with another project in order to hone our skills and find a nice medium between style and simplicity that allows Alli the ability to refine her art into a style that will do OoME’s detailed world justice and also allow her to be able to produce more pages than the one per week. Why do we not simply move forward doing this with OoME? The art style has already changed significantly, as some of you have noticed. With the shading going from a gradiant base to a purple hue – what’s the big problem with just movin forward with more changes? The answer is complex: Alli needs to shift gears and already feels as though she is not doing the world of Tess’la justice with her lack of drive. So with this new project, we plan on working out the kinks with our art in a new setting – one that doesn’t have as serious a tone and as long of a run. So, what is this new project? Well, it’s called My Hero! It follows the adventure of Hasera Keenar – a young Guardian who has been assigned to the greatest Champion of the 9 realms – a dream come true for her… Except… well… you’ll have to give it a read to find out more! The most important difference is that My Hero!’s art style is far more simplified when it comes to design elements – this means Alli may be capable of producing a page in half the time it took her to get a single page of OoME completed. This means there is far more of a likelihood of two pages per week! Meaning the story can progress at a faster pace and you, the fans, will get even more of Alli’s gorgeous art per week! Truth be told, OoME was our Magnum Opus and we started on it before we were prepared. With My Hero! we plan on learning more, completing the story, getting some books printed, the works. We plan on using our gained knowledge to provide a better story, art and experience for you all. When all this is done, we will be re-boot OoME and we hope that you will all join us again when that happens. Thank you so much for your patience, support and feedback throughout these last four years! Here’s to you all enjoying the new project and to many more years of discussion between us all!